Barbara Hamill is the 2015 Golf Manitoba Distinguished Service Award Recipient. Barbara started her volunteering with the Manitoba Ladies Golf Association (MLGA) in 1991. She volunteered in a wide range of roles leading up to the Executive as Secretary/ Treasurer and eventually as Vice President only vacating this position due to family health issues. She was also very involved at St. Charles Country Club volunteering on the Sports Committee, introducing the Social Committee, became the Sports Captain as well as the Lady Captain of St. Charles, sat on the Play and Rules committee and the Grounds committee and founded & Chaired St. Charles Ladies’ Invitational Golf Tournament which continues as a major fundraising event at St. Charles today. In 2000, Barbara became the committee chair of the MLGA tasked to write a manual for Sports Captains in Manitoba and North West Ontario. She began course rating in 1997 with the MLGA and has continued on to this day. In 2010, she received the designation of Master Rater based on the high level knowledge and experience she has. Barbara also became a rules official in 2009. In addition to her roles as a course rater and rules official, she also volunteers as a starter, scorer, course marking, and pace of play official at Golf Manitoba Championships. “On behalf of the Board and Staff of Golf Manitoba, it gives me great pleasure to congratulate Barbara Hamill on receiving this prestigious award,” commented Tammy Gibson, newly elected President of Golf Manitoba. “Her passion, enthusiasm, commitment and dedication to the game of golf over the past 25 years make her a most worthy recipient and we are truly appreciative of her continued involvement with Golf Manitoba.” added Gibson. 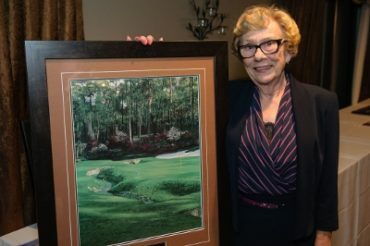 Golf Manitoba is very pleased to honor Ms. Barbara Hamill as the Distinguished Service Award Recipient for 2015.